Retail Choice Has Doubled in the US—Does It Matter for Electric Industry Innovation? States with competitive electricity markets are not always on the cutting edge. 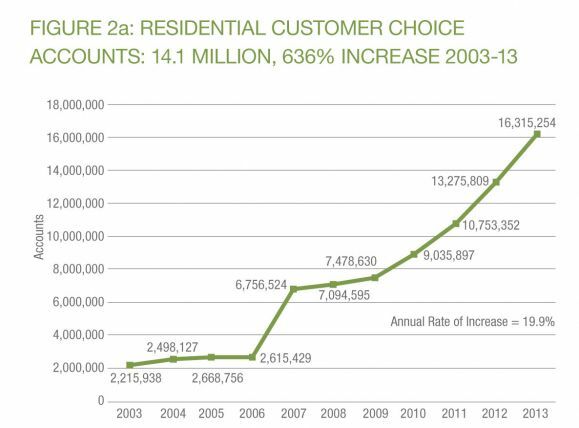 In recent years, the number of residential customers choosing their electricity provider has grown considerably. There were more than 16 million accounts with competitive suppliers in 2013, double the amount in 2010, according to a new study from Compete Coalition, a nonprofit that supports retail choice in electricity markets. Thirteen states and the District of Columbia are deregulated to allow companies and consumers to choose their electricity supplier. In the other states, utility customers are served by a regulated monopoly. In 2014, competitive suppliers served nearly 60 percent of the loads in areas where they are allowed to operate. In the past few decades, electricity prices have gone up nationwide, but the increases have been more moderate in places where there is retail competition, according to the study. When adjusted for inflation over the past decade, the difference is low for homeowners, but high for the C&I sector. However, many of the states with retail choice had higher prices to begin with. 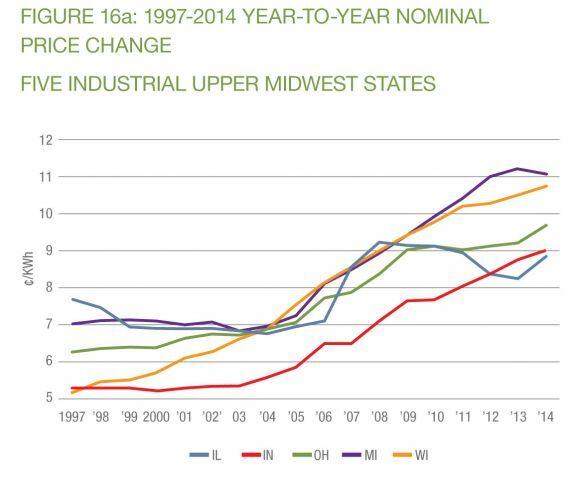 The study pointed to one deregulated state, Illinois, which saw prices rising quickly during the 1990s. But more recently, rates have stabilized there, while other states in the region served by electricity monopolies have seen prices climb. The Compete Coalition also found that states with competitive choice outperformed monopoly states on capacity factor and maintained similar resource adequacy. The report seeks to disprove the notion that retail choice in electricity markets hampers reliability and hurts consumers financially. However, given the changing utility landscape, perhaps the question should no longer be whether retail choice is good for consumers. 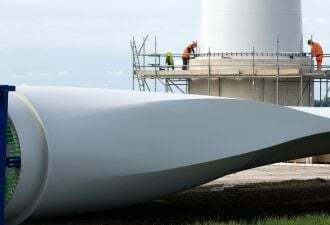 Instead, it should focus more broadly on what kind of markets enable a healthy energy landscape for customers and for the companies that keep the lights on. Compete Coalition noted that it is time to tackle other issues, but seemed to misidentify what the most pressing issues are. For example, the organization suggested the debate should move toward whether regulated or deregulated states are better at empowering customers and accommodating new technologies such as smart meters. 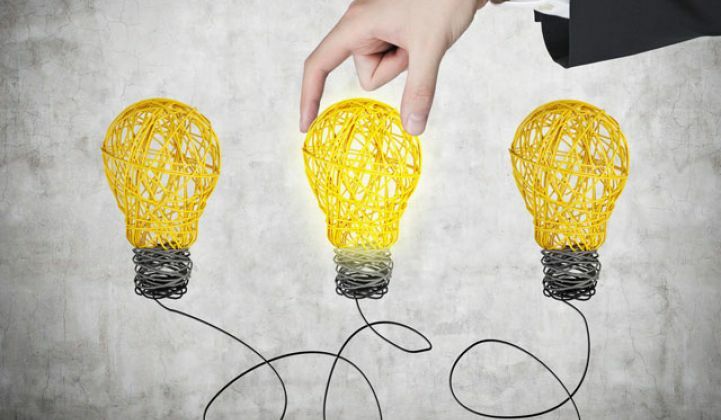 But evaluating states in terms of innovation based solely on regulated or deregulated status is a bit myopic, as there are various ways in which legislators and regulators can influence utilities. Arguably, some of the most forward-thinking changes from regulators are happening in regulated states, such as Hawaii and California. On the other hand, broad overhauls of energy markets that will allow for markets at the distribution level, such as what is happening in New York, are only possible in the short term because New York is already deregulated, according to Audrey Zibelman, chair of the state's Public Service Commission. Whether the regulated or deregulated construct is the best approach depends in part on what the state is trying to accomplish. In New York, it's about creating an energy market at the distribution level. In Hawaii, it's about integrating very high levels of renewable energy. In many cases, deregulated states do not necessarily have the highest levels of renewables. Instead, many of the increases in renewables penetration have been driven by renewable portfolio standards and other factors. Distributed rooftop solar is also impacted by other forces outside of customer options between retail electric providers. For customers who want to buy only solar energy through their electric provider, rather than wind power, there has been one standalone offering in the retail choice markets, such as Texas, with Green Mountain Energy’s SolarSPARC 100 electricity plan. But retail environments are encouraging energy players and other consumer-facing customers to get creative. In Pennsylvania, for example, Comcast piloted a partnership with NRG -- and NRG has become one of the top U.S. home solar providers, after acquiring leading independent installers. It’s not simply about the question of regulated versus deregulated markets, but also about shifting customer relationships. People can choose a third-party solar provider in many states, largely circumventing the regulated utility. NRG, for example, sees regulated California as a key market for its solar and home energy management services, even though it is also active in deregulated states. Within this rapidly evolving, nuanced landscape, deregulated states may be able to adapt more quickly to the changing environment -- but that is yet to be proven.